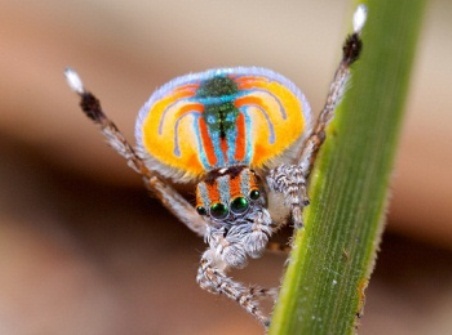 Maratus volans, is better known as the Peacock Spider - no guess just how it got that name. 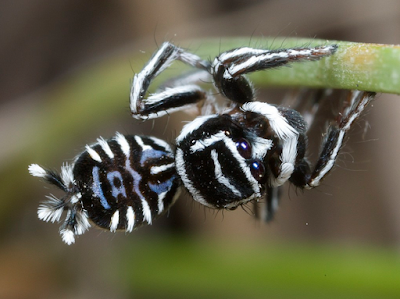 These tiny critters are only found in Australia and China. You have most probably seen them but really not taken that much notice as they are just so small. What you may have observed however, is the distance they can leap (or jump) up to 20 times their length - which is from 3-5mm. 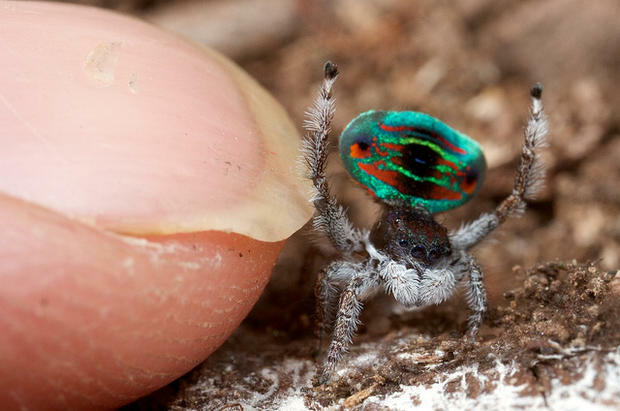 Peacock spiders have incredible eyesight - this has evolved as a predatory weapon. They can see its prey from metres away and are very cat-like in their demeanour by stalking and creeping up and then jumping to pounce and deliver an instant fatal bite to their prey. 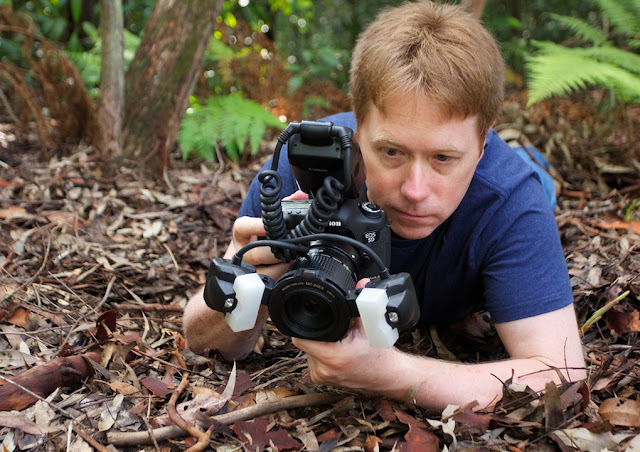 These little spiders first grabbed the attention of Jurgen Otto in 2005 when he was walking through the Ku-ring-gai Chase National Park in Sydney's north. 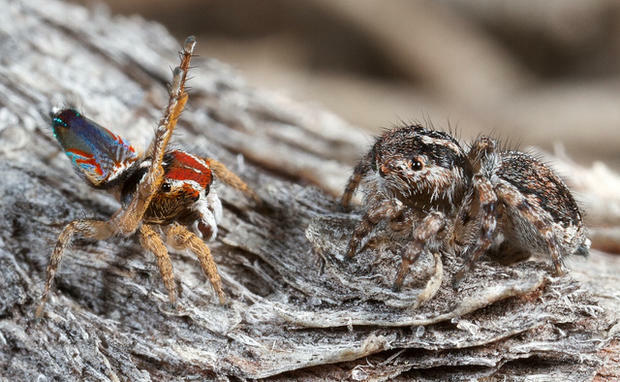 These spiders were first described in 1874 by English naturalist Octavius Pickard-Cambridge, who named it volans (Latin for flying) because he assumed that its two colourful abdominal flaps allowed it to glide. 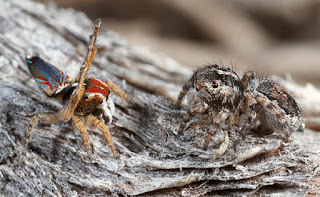 Jurgen was intrigued by this notion that the spider may be able to fly using its flaps but questioned this assumption when he came across a reference to a related species that uses its brightly coloured flaps for mating purposes. 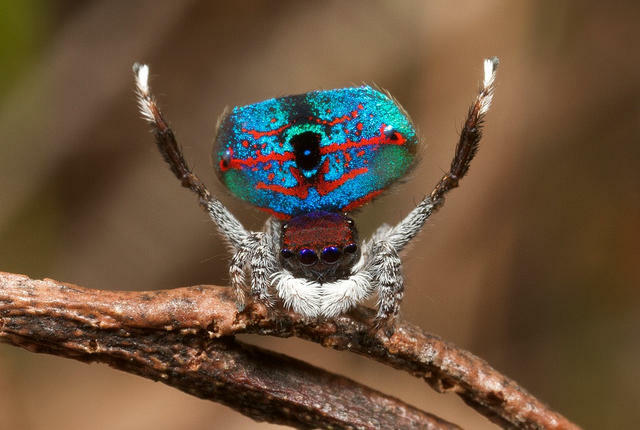 The unique colouring of these arachnids are quite spectacular however, it is only the males that possess this colourful beauty for the sole purpose of attracting the attention of the female (who are quite dull looking). Jurgen's patience paid off when three years later he observed a male 'strutting his stuff' to a female where he confirmed that the flaps are used solely for mating purposes. To see the intriguing Peacock Spider showing his colours and doing his mating movements please see this Catalyst story where you will be able to observe its sideways movements, flared flaps and waving his third legs hypnotically. If she succumbs to his advances, he will be allowed to mate with her, but if scorned he had better escape fairly quickly as he could end up as her dinner! All images in this post are the work of Jurgen Otto (seen above).